ttyf1757 has no other items for sale. Item is sealed and well packaged. Brand new with Lenovo box from the factory. Perfect transaction, fast shipping. Serious seller to recommend. Original keyboard, it is just perfect! I like the keyboard. I'm used to using the technology and layout in my work issued laptop. I needed a small keyboard to fit my home PC setup which has a pressure sensitive tablet that takes up a lot of the desk. This keyboard was exactly what I was looking for. The 4 star is because one leg broke when it got knocked off the desk. I made a new support from an angled block of wood. With that in place the keyboard is back in operation. Overall very satisfied with the product. Original island-style robust Thinkpad keyboard with trackpoint. Original island-style Thinkpad keyboard with trackpoint. 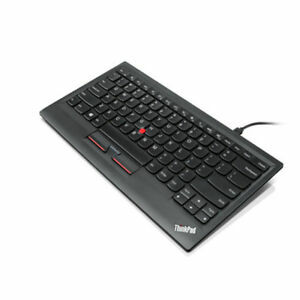 Good solution for those who don't like to use touchpad and for those who are not missing "old style" Thinkpad keyboard which disappeared with x220 Trackpoint allows not to move the hands away from keyboard when the mouse moves are needed. And obviously Thinkpad trackpoints are the best on the market. Keystrokes are stable and "clicky" enough for daily usage, especially if you are not a big fan of the Apple "butterfly" solution. Overall very satisfied with the product. Good and robust keyboard with the mouse moving option, which allows to move the mouse without moving your hands away from keyboard (unlike touchpad or mouse). Typing experience is very pleasant as well. Of course if you're not bonded to mechanical keyboards. Okay, Lenovo, I Give Up ! For years I've fought moving to USB (vs PS2) keyboards and Lenovo's newly mapped ThinkPad keyboard layout. I give up. Just bought three of these for desktops to start cutting over to the "new & improved" ThinkPad ... yuck. If ya' gotta' do, these are a sensible choice. Anyway, it's an excellent product and helping this old dog to learn new tricks.